Sentiments/Non-Humans: Has no problem with them as long as they have no problem with him but might turn a jaundiced eye on any clearly evil being he encountered. Sentiments/Coalition: Fears the CS and avoids them when practical. After learning the fate of his homeworld he grudgingly accepts that humans on Earth are in a similar situation and that many people in the CS are just fighting to survive. Disposition: Speaks in an unusually cultured tone of voice for a full conversion 'borg. Is generally open and friendly but can be a bit naive at times. Wants to make the best of a bad situation with regards to being stranded on Earth. Description: An 8 foot tall cyborg with a predominantly dark grey chassis with dark gold trim that appears to be a bit more ornate than most human 'borgs. The head is styled to look mostly organic with tiger-like black stripes on the pale skin of his face, hair drawn up in a flowing topknot, and pointed ears. His electric blue eyes are the only obviously mechanical part of his face. Clearly a cyborg, making disguise impossible. Simulated sense of touch is 35-48%. Prowl is -40%, impossible in heavy cyborg armor. Skills that require sensitive and nimble fingers and hands are -40% (Locksmith). +1 to save vs horror factor. Speaks all Earth languages at 96% efficiency (built-in language translator). Max. Carrying Weight: 540 lbs. Max. Lifting Weight: 1080 lbs. ☞ Paralysis - 4 doses: Takes effect in 1d4 melees, lasts for 2d6 minutes. ☞ Poison - 4 doses: Takes effect in 1d4, does 6d6 S.D./Hit Point damage. ☞ Tranq/Sleep - 4 dose: Takes effect in 1d4 melees, lasts 4d6 minutes. ☞ Truth Serum - 4doses: Takes effect in 2d6 minutes, last 3d6 minutes. Last edited by Yanso on Tue Oct 10, 2017 3:34 am, edited 100 times in total. ☞ Energy blaster: 6d6 M.D. Crew: Two, a pilot and gunner. Can accommodate two passengers comfortably, a third can be squeezed in, but makes for cramped, uncomfortable conditions. * Attacker must make a called shot" to hit at -3 to strike. ‡ Destroying one of the bottom hover jets reduces speed by 10%. Destroying one of the rear jets reduces speed by 20%. ** Depleting the M.D.C. of the main body completely destroys the vehicle. Flying: 150 mph, cruising speed is between 50-80 mph. VTOL capable, can hover stationary; retractable landing gear. Maximum altitude is limited to about 1,500'. Water: The patrol car can also skim across the surface of water at a speed of 110 mph. Underwater speed is 40mph, with a maximum depth of 300'. Flying Range: The nuclear power supply gives the vehicle decades of life. The Skull patrol car is a workhorse that can be flown continuously for 96 hours without fear of overheating. Cargo: Minimal storage space, about three feet behind seats for extra clothing, weapons, and personal items. Power System: Nuclear, average energy life is 20 years. Damage: 6D6 M.D. per blast. Damage: Varies with missile type. Rate of Fire: One at a time or in volleys of two. Payload: 2; one missile in each launcher. 3. Sensors: Short Range Radio, Long Range Radio, Infrared Optics, Short-Range Radar. Last edited by Yanso on Wed Nov 08, 2017 5:41 am, edited 39 times in total. Like a bright, flaring jewel the exceptional amount of rift activity on planet Earth called out to the Kremin people. 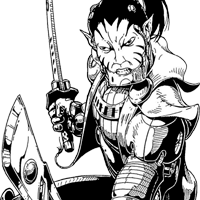 Yan-Sovil Lukada was fortunate enough, or so he thought, to be part of the first exploratory mission sent to Earth to begin work on establishing a forward base from which the Kremin people could explore the planet - and thus the cosmos - by way of the rifts. Needless to say, things didn't exactly go according to plan. Almost as soon as they rifted to Earth things began to go terribly wrong. The portal became unstable, with the last hurried message from the Kremin Homeworld telling the expedition they would reconnect the link as soon as they could figure out what was wrong. In order to maintain focus and discipline among the expedition at the disturbing turn of events, the leaders sent patrols out to recon the nearby area while the remaining Kremin stayed behind to set up camp. Yan-Sovil's patrol ran into what he would later realize were Coalition forces that were sent to investigate the unusual rift activity in the area. A firefight quickly broke out when the Kremin were attacked without provocation. The Kremin gave as good as they got, but in the end a fresh round of Coalition reinforcements spelled doom for the outgunned patrol. When the inevitable outcome dawned on the Kremin squad commander, he drew Yan-Sovil aside and told him to get a message back to the base camp warning them of the hostile nature of the natives. The remaining Kremin of the patrol would draw the Coalition's attention away from him to give him an opening to escape, then break up into singles and pairs and try to make it back to camp after eluding the natives. Yan-Sovil had little faith in the plan but it was not his place to question orders. 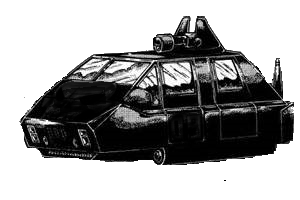 With the help of the squad commander, Yan-Sovil was able to commandeer one of the native vehicles to aid in his escape. As he struggled to keep the unfamiliar hovercar under control during the mad dash back to the base camp, Yan-Sovil finally realized why the squad commander chose him, specifically, to go back. By virtue of being the only mechanical engineer in the patrol he was probably the only one who had a real chance of piloting some strange new vehicle on this strange world. Cyborgs were fast, but with no vehicles of their own even the Kremin would be hard pressed to outrun these native machines. Yan-Sovil again thought of the rest of the commander's plan - to draw the natives away from the camp's direction and ditch them before doubling back. You knew that wasn't going to happen, didn't you, sir? You will be remembered. The rest of the patrol was never heard from again. When he returned to the base camp, chaos reigned. The staccato flash and roar of high powered weaponry was bursting all around the camp as the hovercar flew into view around a bend in the terrain. At first Yan-Sovil assumed it was more of the same natives that attacked his patrol, but as he got closer he realized this was not the case. Strange creatures were attacking the camp from all sides. Some of them glowed with unknown energies and were able to shrug off laser and railgun fire from the embattled Kremin. What few humanoid beings he saw among the attackers looked nothing like the natives his patrol ran into just a relatively short distance from here. What have we gotten ourselves into here on this damn planet? Further thought was rendered impractical as a thunderous explosion rocked the hovercar. The cockpit filled up with smoke and it was all Yan-Sovil could do to keep the craft from falling out of the sky like a brick. What the hell was that?!? Those attackers didn't have any missiles that I could see. As his purloined hovercar careened out of control and down into the forest, Yan-Sovil realized at the last moment where the missiles came from. They came from your fellow Kremin, dummy. They are currently under attack and have no idea who is piloting this unknown craft blazing recklessly toward them. And Yan-Sovil had forgot to radio ahead to let them know he was the pilot. "Ah, crap." Yan-Sovil said, right before the impact sent him into darkness. Some time later, after his nano restorers did their work, he regained consciousness and climbed his way stiffly out of the downed hovercar. He had crashed a couple miles away from the base camp and so he ran in that direction as fast as his bionic legs would go. I can still complete my mission.... if anyone is left to warn, that is. It was obvious to Yan-Sovil the battle was long over as he neared the camp because no weapons fire could be heard, which he hoped was a good sign. He was only partly right. It turned out the battle had been over for almost two days. The Kremin were finally able to beat back the creatures, but at the devastating cost of the lives of half the remaining Kremin in camp. To make things worse, they had been unable to reestablish contact with the Homeworld. These events, combined with Yan-Sovil's report of the loss of his patrol to a completely different faction of hostiles not far away, left the remaining Kremin in despair and disarray. It was decided by what remained of the leadership that it would be best to split into small groups, as it seemed apparent that large numbers of 8-foot tall cyborgs gathering in one place was bound to attract more unwanted attention from the natives. Yan-Sovil was able to patch up his stolen hovercar and with two other Kremin survivors set out looking for any scrap of civilization on this world that was not predisposed to attack them on sight. By the time they found one, only Yan-Sovil and one of the survivors were left. The other had fallen victim to a cybersnatcher gang when they made the mistake of letting their guard down in some unnamed slum they stumbled into a few weeks after leaving the stillborn base camp. The two remaining Kremin bounced around from town to town until one day they ran into another group of Kremin that were not part of the original expedition. It was then that they found out the cataclysmic fate of their Homeworld. The realization that most, if not all, of their friends and family were now gone and they would in all likelihood never be able to go home again was a crushing blow. Yan-Sovil's remaining companion chose to leave with the others in search of more Kremin refugees to the west. After saying their farewells, Yan-Sovil hopped in his hovercar and set course for Merctown. That seemed to be the best place to find work. And prepare. Some day the creatures that overran my planet will come here, to this rift-scarred beacon of madness in the void. It is inevitable. When that day comes I will be ready. And I will have my revenge. Last edited by Yanso on Sun May 21, 2017 7:23 am, edited 1 time in total.